A comfort station for the dune dwellers. There’s a bright new beacon of hope out on the Samoa Peninsula, which we figure dune lovers and gotta-go antsy foot-hoppers can’t help but appreciate. 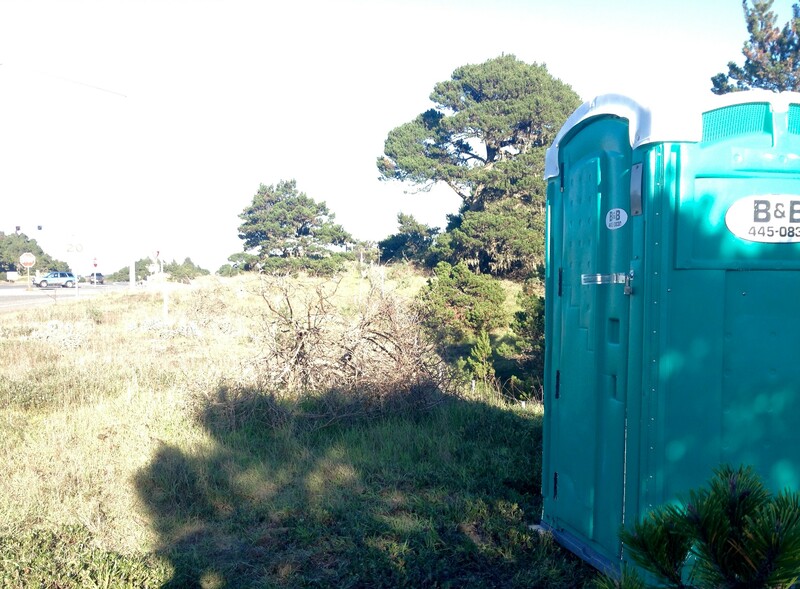 Yes, it’s a public portable toilet, rented for $80 a month from B&B by the Humboldt Bay Harbor, Recreation and Conservation District for the benefit of those frequenting the wilds of Samoa. Harbor Commissioner Richard Marks, who’s lived in Samoa 35 years, says he’s been agitating for relief in the dunes for longer than he can remember (and he blogs about this and other stuff over at samoasoftball). He’s gone before the county supervisors, talked with social services providers, toured potential sites with other official-types — always, he says, there are roadblocks. And even after harbor district staff finally, in November, installed a portable toilet south of the Samoa bridge not far from the Samoa Cookhouse, two weeks later they had to move it because somebody complained it was “an attractive nuisance.” In legalese, that’s something that could attract kids who might be unaware of the potential evil that could lurk within. Marks says he heard the complainer feared the potty might, specifically, invite clandestine drug dealing. The district moved the toilet to a nearby location on harbor district property that’s less convenient to vehicle access. It’s close to where State Route 255 Ts with Samoa Boulevard. Marks sounds, over the phone, irritated that some people might be disturbed by the new public offering. An estimated 100 or more homeless people, many crossing the bridge from Eureka, sleep in the peninsula dunes each night, Marks says — obviously they have to go somewhere. “This is only what I think of as a positive for the public and the environment,” he says. Now he wishes there could be a porta potty installed behind the Bayshore Mall in Eureka, where an estimated 200 or so camp illegally in the marshy bushes.